Almost all antennas need something to get them up in the air. Trees are commonly used for dipoles, wire verticals, slopers, Inverted Vee's and so forth. Towers, poles and roof tripods are often used for multi-element "beams" or verticals as well. Portable operation often raises the need for some kind of transportable mast as trees or other supports may not be available or convenient. Enter the fiberglass push-up pole or mast. I've used two such masts with good results. This page and the links discuss those. 2019-02-05 This morning while "working out" on the treadmill I was watching a YouTube video of a ham going into the woods near his house, setting up and making a contact over 3000 miles away with just a couple watts. The thing that intrigued me was that he had so much trouble trying to put up his fiberglass push-up mast that he gave up. It appeared that like many others I've watched he was extending his mast on the ground, attaching the antenna connection and then trying to stand up the unwieldy thing! I remember trying that when I first got my push-up mast and thinking, there has to be a better way! My "better way" was to come up with a way to stand the pole up collapsed or at least partially collapsed, and guy it in the vertical position. Then I attach the antenna, leaving its ends and the coax (if it is fed at the top of the mast) hanging down and then push up the mast section by section. Once fully extended I can attach the loose ends to surrounding trees or whatever. To guy the partially pushed-up mast I came up with a collar that would fit somewhat loosely on the section above the guy point, sitting on top of that lower section. I found that if the collar was about three or four feet up and the three guy lines went out about four to six feet the mast is stable. One does need to extent enough top sections that the tip is above the guy point or you won't be able to extract it from the partially pushed-up mast. Shakespeare TSP20 Six-Piece Wonderpole guyed with three guy ropes about four feet from the bottom. Mast is supporting a 40/20 meter fan dipole. 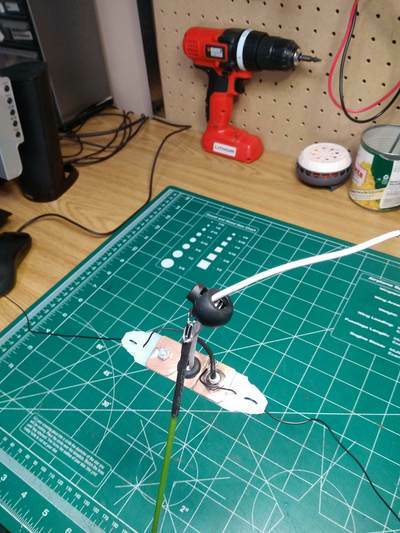 Using this approach I can have my mast up with antenna furled in just a few minutes by myself and avoid balancing it like a broom on your nose in the process! 2018-08-10 This afternoon I decided to try the 40/20 meter trap inverted vee with my 5.4 meter Bamboo Pattern 11 Section Telescoping Fishing Rod and see if I could make some contacts. As expected the FT817nd liked the low swr on both bands and put out full power on both 40 and 20. There were very few QSOs on either band but I did finally snag one 40 meter CW QSO with KC0M in Branson, MO, just under 400 miles away for a brief but solid QSO. He gave me a 579 and he was a strong 589 in here. 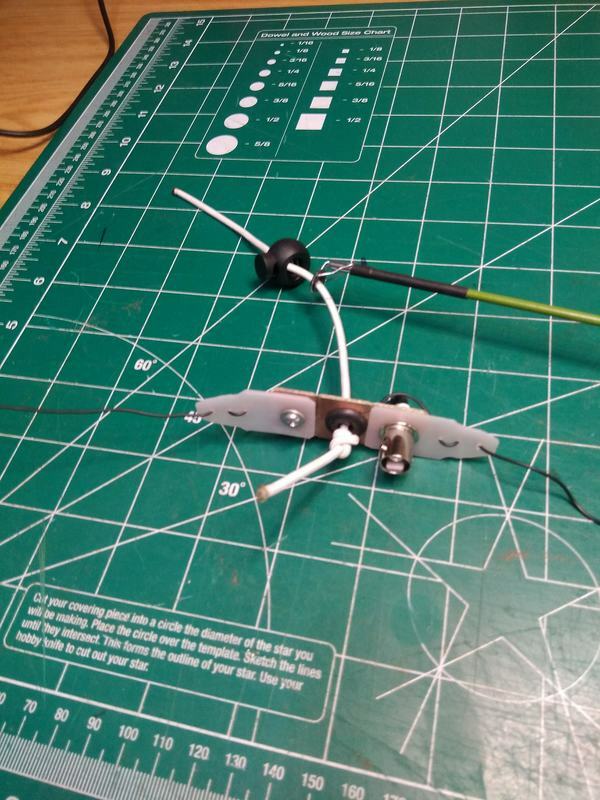 The antenna set up easily using the shock cord arrangement described and shown below. I think it is a keeper. Sorry the picture at right isn't clearer but hopefully it shows how it all goes together. As it shows the pole coming in from the bottom left corner flexes quite a bit. 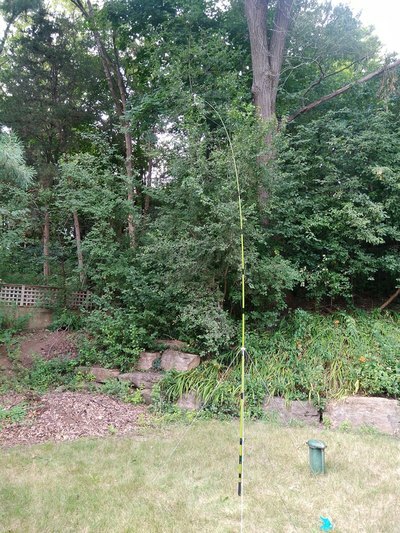 2018-08-10 One issue I faced with both of my fiberglass fishing pole masts is how to attach an antenna to them. The Wonderpole came with an eyelet on the tip which worked fine for attaching my 32 ft wire. I simply formed a loop at the end of the wire, attached a small clip sort of like a safety pin and clipped the antenna on. As mentioned below, the 5.4 meter fishing pole did not have anything on its tip. So I bought a fishing pole eyelet and attached it. That worked well for the 32 ft. antenna. But an inverted vee presents a different problem as you have to support the center. I describe my solution for the Wonderpole on my pages about both the 40/20 meter fan inverted vee and the 40/20 meter trap inverted vee using a piece of pc board and a grommet. But that won't work on the 5.4 meter pole as it is way to small near the tip. So, after thinking about it for a while I came up with the idea of using a short piece of shock cord and a cord lock. The photos show the result. Very simple. 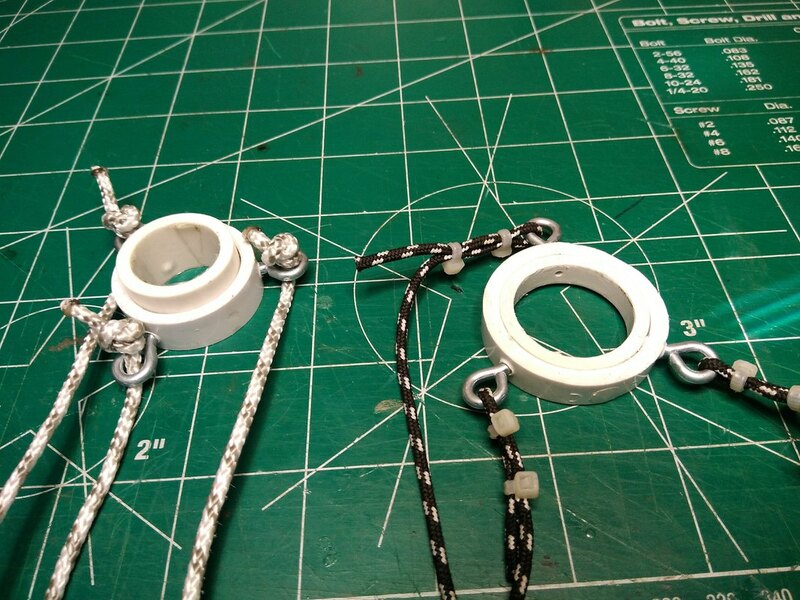 Just tie a knot in the shock cord near one end and pass the cord through the center insulator from the bottom. Then put the upper end of the shock cord through the eyelet on the fishing pole with the cord lock above it to keep the cord from pulling through. It is simple to make and to attach both of which I like. 2018-08-08 I've played with two portable masts. 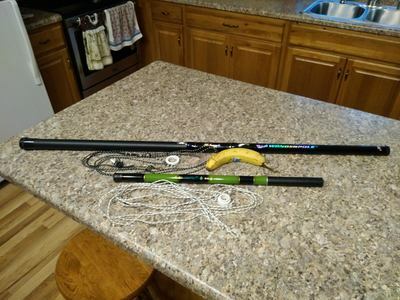 I have the most experience with a Shakespeare TSP20 Six-Piece Wonderpole fishing pole with the top element removed so the antenna center is 16 ft. 6 in. from the ground. It's pretty sturdy, easy to erect and fairly light weight at just over 1.3 lbs. My friend and I used two of them on the recent 2018 ARRL Field Day. One to hold the center of a 40/20 meter fan inverted vee and one to hold the center of a 40/20 meter trap inverted vee. 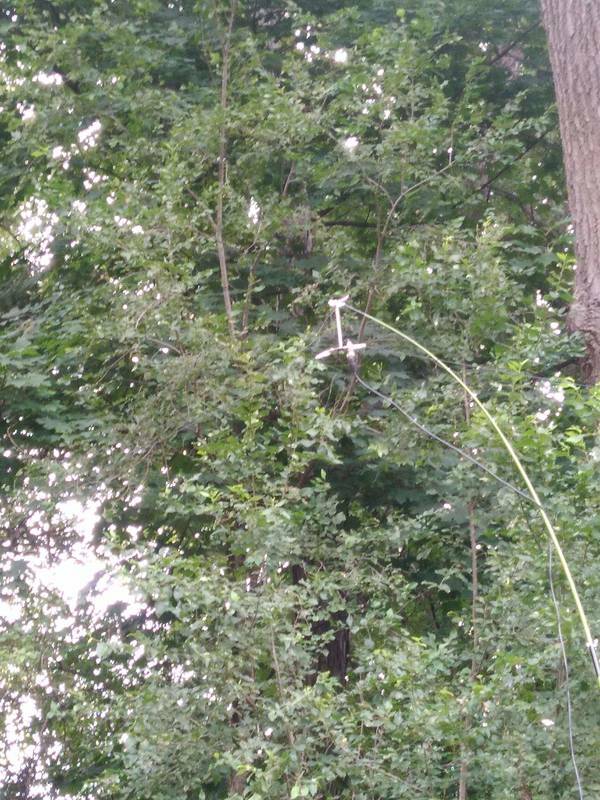 Since then I've played in my back yard with a 35 ft. end fed wire antenna. It works well with all of them. If it has any down side it is its collapsed length of 45 inches. That is not an issue when driving to your site and it can even be lashed to a backpack for a walk-in site. But it is a bit unwieldy for that. 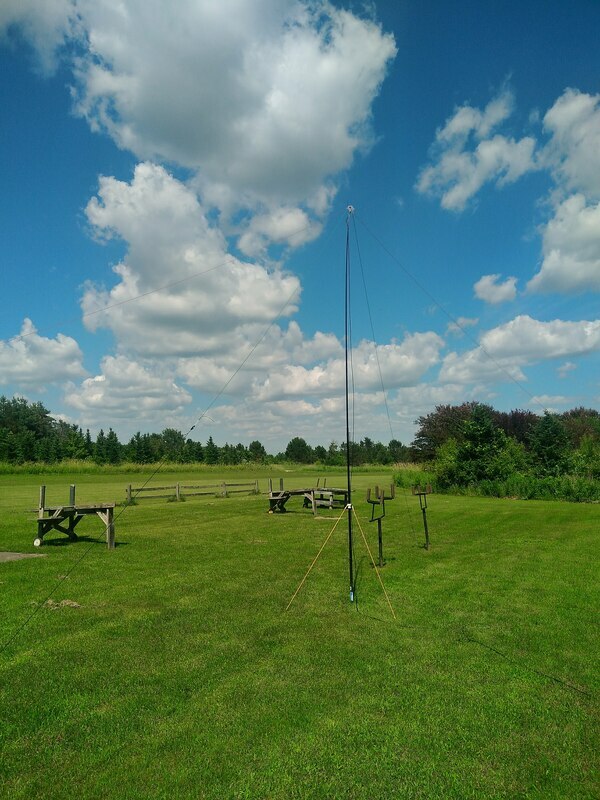 2018-08-09 This afternoon just before a rain started I quickly put up my 5.4 meter mast from China and rigged a way to tie the center of my 40/20 meter inverted vee to it. I wanted to see if the foot or so shorter mast would have any appreciable impact on the SWR of the antenna. As nearly as I could determine using the mfj 259b antenna analyzer, which is what I've used for my other tests, there is no noticeable difference. Of course the antenna may be even more of an NVIS antenna with the center angle being a bit flatter and thus the ends approaching the ground quicker. Not sure how I might test that. The photos show the mast in my back yard with the antenna on it. 2018-08-08 Just this week after waiting for over a month, I received from China another fishing pole mast, a 5.4 meter Bamboo Pattern 11 Section Telescoping Fishing Rod. It measures just 22-1/2 inches when collapsed and stands about 15 feet when opened up with the top section removed. It weighs just slightly over a half pound. It clearly is not as robust as the Shakespeare one but seems to support my 35 ft wire antenna OK. This pole came without anything on the tip to connect the antenna to. So I got a Danielson Rot Tip Repair Kit at the local Dunham's Sports store and cemented it to the rod tip using an instant cure cyanoarcrylate cement from a local hobby store. With most portable masts you are going to need some way to guy it to keep it upright. In some cases the antenna wires themselves can serve at least in part as guy wires. SOTAbeams has a video showing how to erect and guy their pole with the antenna. They use the two legs of an inverted vee, the feedline and a single guy wire which is a very good approach in some cases. It is worth watching as their "business" is gear for operators going to mountain summits to make contacts. They have a lot of experience, some in fairly challenging antenna situations. I decided to fabricated collars for my fiberglass masts from scrap PVC pipe and fittings that seem to work. I've yet to really test the smaller one in the field but my collar arrangement worked on Field Day for the Shakespeare masts. 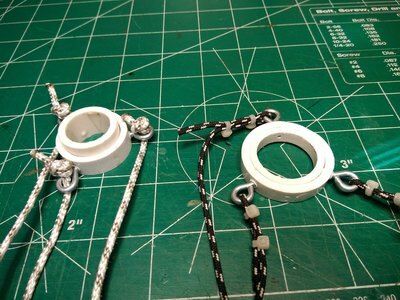 The two masts and my fabricated collars with guy lines are shown below. The guy lines themselves are five to six feet long. 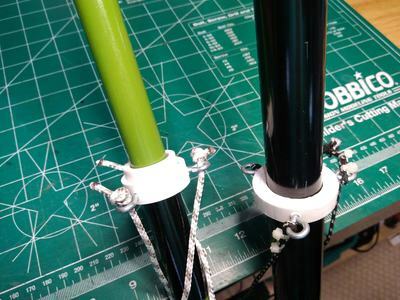 The collar fits on top of the bottom section of the larger mast and the third one on the smaller one. Finding PVC pipes and fittings that just slip over the upper section of the mast and sit nicely on top of a lower segment is part of the fun!